I’m hoping now that wedding craziness has ended, and I’ve regained my waking moments free from wedding planning thoughts, I can return to baking and blogging. Adam and I ‘celebrated’ our one month-aversary monday evening with drinks & some appetizers at a restaurant down the street. We came home to share some italian pastries from the same bakery that we used for our wedding – since we both didn’t eat a single dessert at the wedding. Shocking – since i’m a self-professed dessert lover and foodie. I think someone brought us a mini jar of tiramisu after it was served, but the biscotti had been stolen out of it already and it was mostly cream with some espresso. That didn’t stop us from spooning the coffee creation into each others face. If you follow along over on Instagram (@AliciaBakeaholic) or Snapchat @Aihconti, you’ll have noticed that I’m definitely back in the kitchen making some delicious fall creations. While I didn’t necessarily stop cooking and baking over the summer, it was most certainly less frequently placed on the blog. It was on record our hottest, driest summer yet and turning on an oven just was not what i wanted to do, amidst wedding diy’s. However, I honestly think that fall baking is my most favourite. The flavours (yes, pumpkin spice, but also cinnamon apple), the colours, the fall ingredients popping up in the market produce bins all create the most wonderful dishes and desserts. There’s a squash bin at the produce market i visit frequently that is always fully stocked with butternut, spaghetti squash and buttercup all for .68 cents a pound. Adam and I were even lucky enough to have an early Thanksgiving dinner this week with his family before they jet off to Europe for a couple weeks on Monday. We’re having one with our family on Sunday. 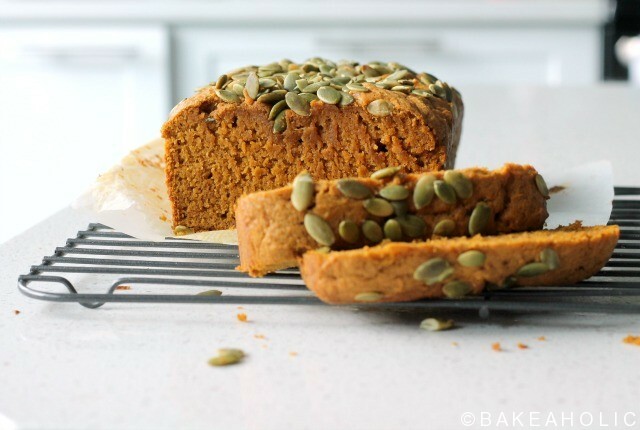 I also love fall baking because of the weather – the cooler days, the sun slung low in the sky, set the tone for cozying up in the kitchen with a good cookbook. 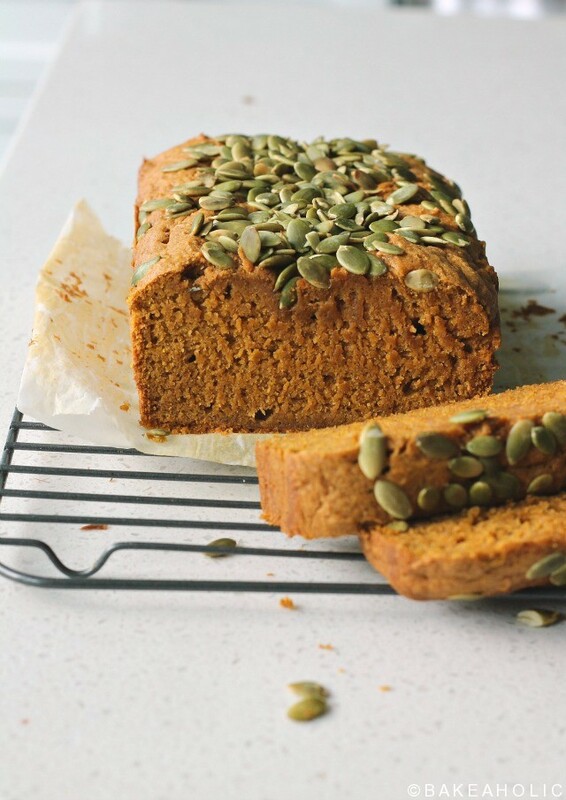 I had leftover pumpkin from some muffins that didn’t turn out quite right, and decided to make a pumpkin loaf. I loosely used my basic banana bread recipe, and swapped out the banana for pumpkin, and of course added some pumpkin pie spices. I decided to make two loaves, since it takes less time to bake two at once, and this way I have another one to give away. 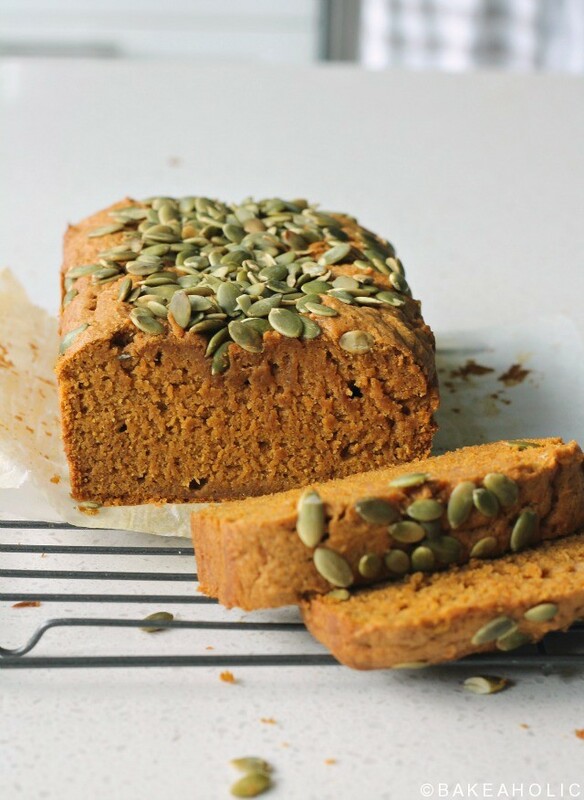 A staple of fall - lightly sweetened and spiced pumpkin loaf. Mix dry ingredients in a medium mixing bowl. In a large bowl using a handheld blender, blend almond milk, melted butter/oil, and eggs. Add in the pumpkin and spices. Mix dry ingredients into wet and blend until combined. Pour batter into prepared loaf pan. 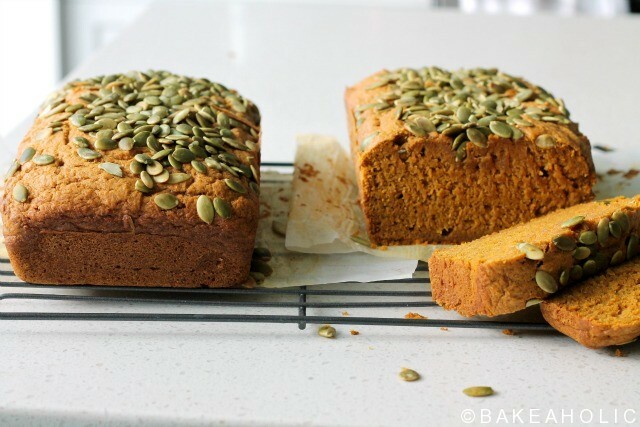 Sprinkle with pumpkin seeds if you like. Turn off the oven, and prop open door. Leave the bread in the oven for an additional 10-15 minutes to make sure the inner loaf is thoroughly baked through. Slice, and freeze easily to bring for lunches.